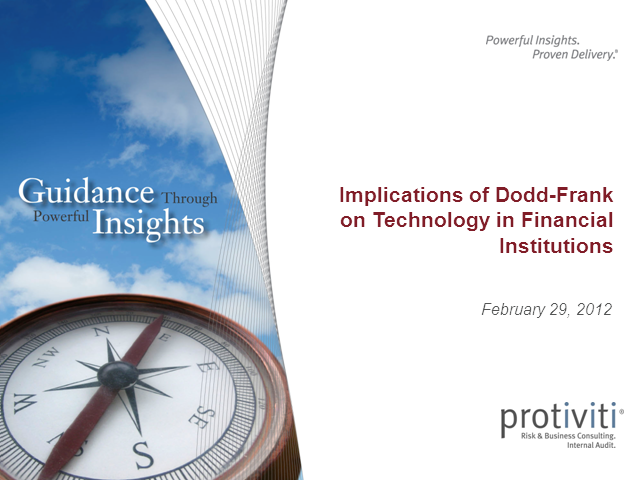 Financial Institutions of all sizes are devoting significant time and resources to understanding, planning, and implementing the Dodd-Frank Act (DFA). One common implementation pitfall is the failure to appreciate the significant impact that DFA will have on technology and the lead time that will be required to effect technology changes. This session will provide insights into how to avoid this pitfall and gain a better understanding of the impact of DFA on technology as well as practical insights from an industry technology leader. o How industry leaders are using technology to support broader DFA change management initiatives.